So here we are! A new year with hopefully many more exciting things on the horizon. I have resolved to be better at telling you all the exciting things that are going on, what I’m up to, what I’m reading and listening to. It’s probably a good idea to start with a round-up of 2015, I feel pretty overwhelmed and lucky for everything that’s happened in the last 12 months. It’s been a corker! So here we go! 2015 really got exciting in January when, to my surprise, I found myself on the shortlist for the Arts Foundation Fellowship for Spoken Word alongside amazing poets Sabrina Mahfouz, Hollie McNish, Rob Auton and Ross Sutherland. We got to perform in the South Bank centre’s Purcell Rooms (there’s a write-up of the night here) which was probably the biggest gig I’d ever done at that time and I was really excited but very nervous too! It went really well though and was a turning point, I now knew that when there was a lot riding on something, a lot of pressure, I could rise to it -hooray! Then there was a fancy award ceremony the next day the likes of which I don’t think happen very often in the poetry scene: free booze (which I drank far too much of) and posh dresses. The wonderful Hollie McNish won the fellowship but I took home £1000 runner-up prize, an excellent experience and loads more people knowing who I am and what I do! I started gigging more and more and actually getting paid (!!) Performance poetry heavyweight Luke Wright asked me to come on tour with him as his support act. I loved racing up and down the country, preforming in all sorts of places to all sorts of audiences an generally having a gay old time. Next! Melody. The show! In the closing months of 2014 my shithot director/editor/all round invaluable collaborator Lucy Allan and I started working on a short scratch of what would become our full-length poetry play Melody. 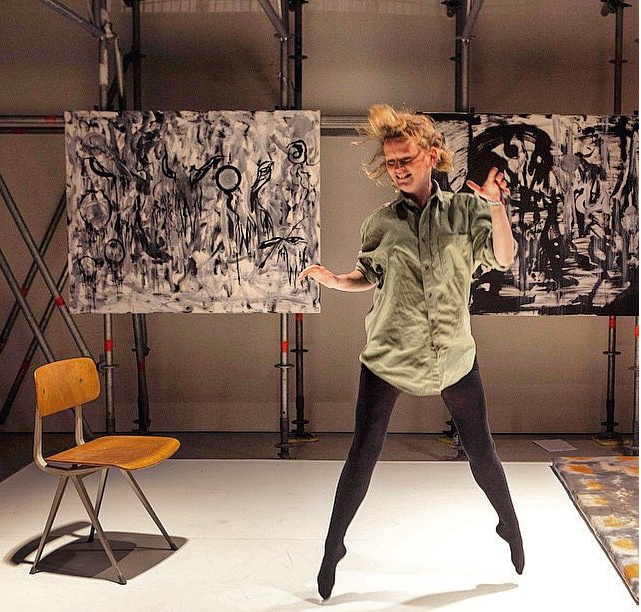 October 2014 saw us present 15 minutes worth of stuff at the South Bank Centre and in March 2015 we presented 10 minutes of different stuff at the Battersea Arts Centre. It was beginning to happen, we had 25 minutes of material so in theory only another 25 to go. In reality, only about 6 minutes of this original stuff ended up in the “final” piece. I say “final” because we are still developing and (we hope!) improving it! The scratches were great though, they provided really useful deadlines (nothing like a deadline to get you working), opportunities to experiment and play as well as really useful audience feedback and encouragement. More on Melody later…. In the spring I got an email and a phone call from the BBC! I was invited to participate in a new and really exciting project called Women Who Spit. Five, young female poets were commissioned to write poems on different topics – I was asked to write about body image – and the BBC were going to make films out of them to be shown on iPlayer. This was my first real commission and I feel honoured to be in the company of tiptop poets Megan Beech, Vanessa Kisuule, Cecelia Knapp and Deanna Rodger. 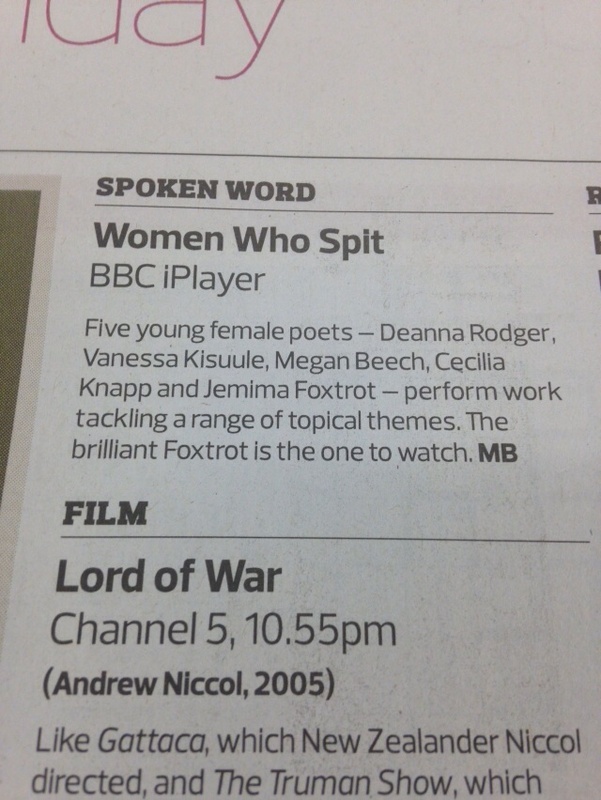 The project was called Women who spit and you can watch the films here. They came out proper good! Very high production values I reckon and a pretty great job all round from BBC Arts. The Observer New Review also said a good thing which I now have pinned to my wall to stop me being lazy and procrastinating… I better get on with stuff otherwise they won’t have owt to watch! Women Who Spit has been watched tons of times by people up and down the country, I got a lot of love for it: strangers emailing me saying how much they enjoyed it and I was busier gigging than ever! It was all kicking off! Back to Melody. 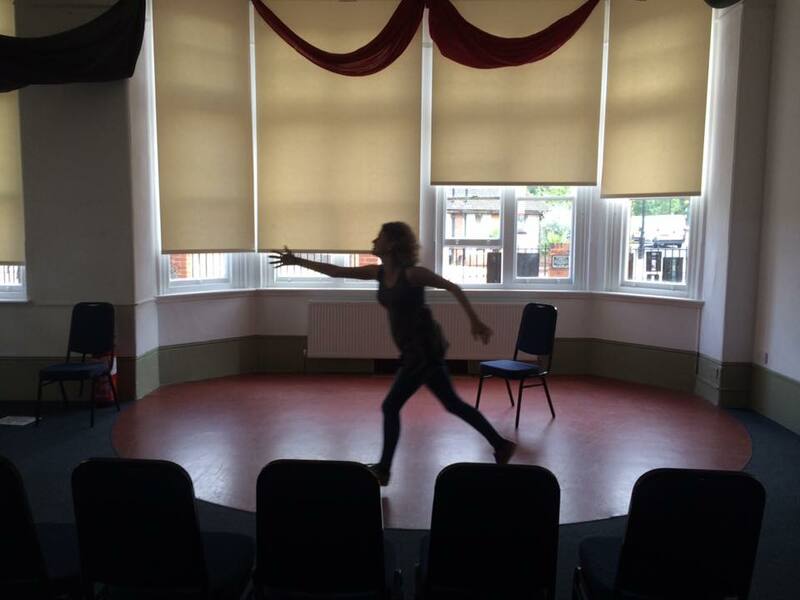 Lucy and I had been given rehearsal space and an opportunity to perform a full-length scratch of the show at the wonderful Clapham Omnibus. It was just what we needed – space, time and a wonderful and supportive audience to share it with after three days of intense theatre making. It was an amazing experience and working with Lucy was so valuable. 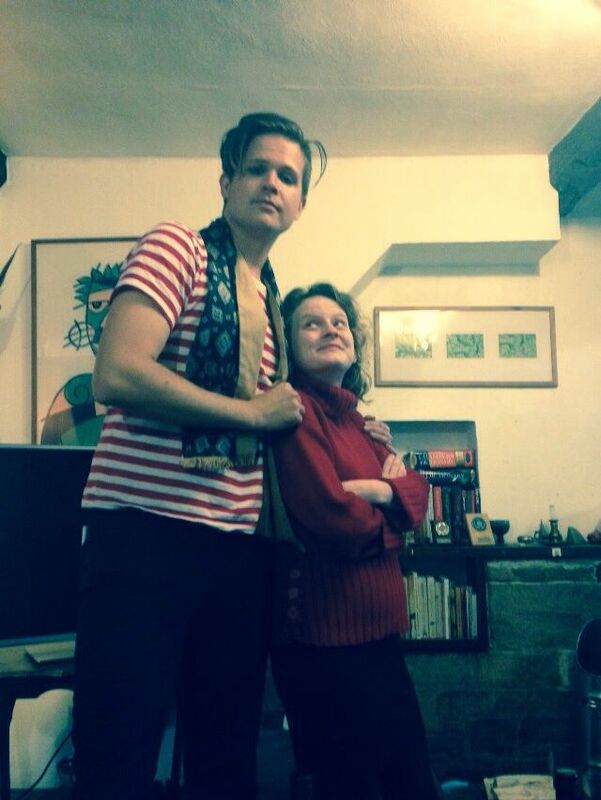 We were gearing up for Edinburgh and it was going pretty well. June! June brought something pretty crazy at it’s end. I performed in the Barbican Main Hall (1943 capacity!) as part of Doug Aitken’s Station to Station with what felt like all the famous people. Incredibe poets Simon Armitage, Don Paterson, Sam Riviere, Lavinia Greenlaw, Paul Farley and Luke Wright (who suggested me for the gig, cheers Luke!) were all there doing their thing. 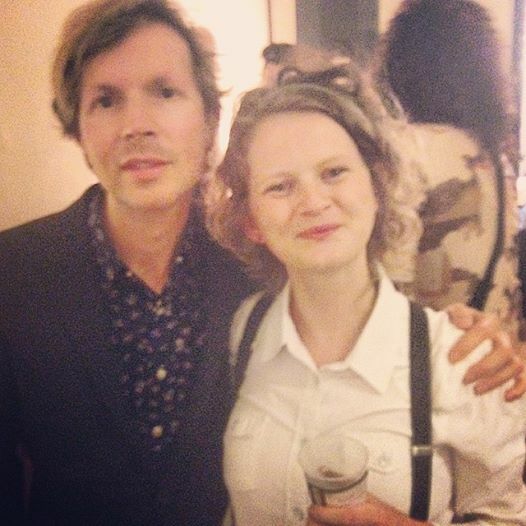 The whole night was curated by Beck (a personal musical hero of mine) and Thurston Moore performed too. It was all a bit much! It felt like I was in another world really and it was great to be given the opportunity to be part of such a great evening. Read the Guardian review here. I also chatted to Lynn Gardner on BBC 2’s Arts Night about the whole thing, my first appearance on television as myself. 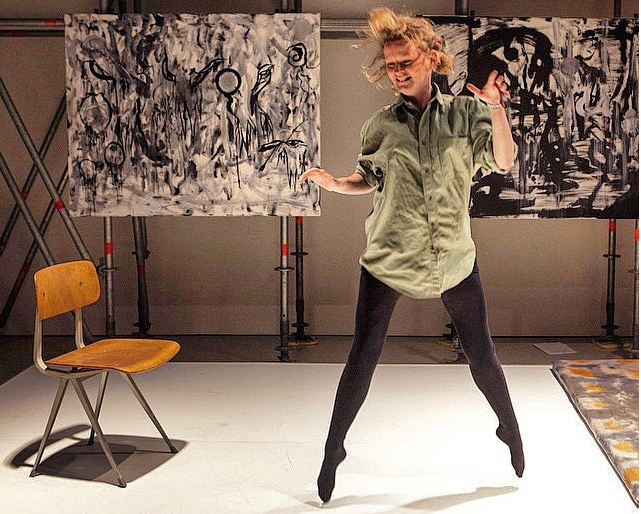 The team at the Barbican and Station to Station invited us to show the most recent version of Melody at the Barbican Art Gallery where they took this action shot! Of course, it was summer now. And summer means festivals! 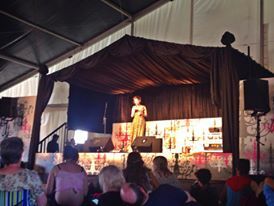 Between July and September I performed my poems at Brainchild, Latitude and Festival Number 6 – all of them life affirming, joy-inducing, messy and magical festivals. I took different companions to each, we had a blast! 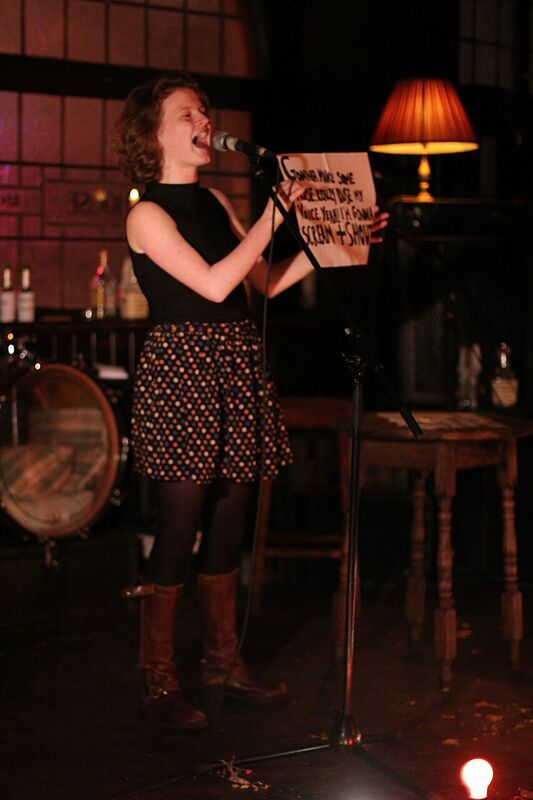 I performed Melody at the 2015 PBH Free Fringe for 21 days in a row to audiences of 1(!!) – 40+ (all that could fit in the venue) an amazing experience which was incredibly intense. When people told me doing a run at the Edinburgh festival was an emotional roller coaster I thought they were exaggerating – they weren’t! 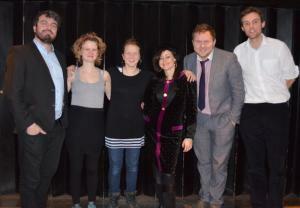 The whole thing was a great success though and we got really great reviews from The Stage, The List and Broadway Baby. 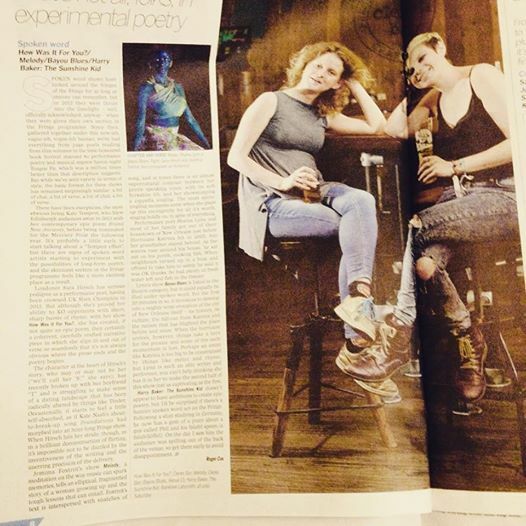 I also appeared in the Scotsman as part of a feature on spoken word shows at the fringe! You can read a Broadway Baby interview with me about the show here. The success of Melody as a full-length piece is my proudest achievement to date, so huge thanks to everyone who made it possible for Lucy and I to make this work and the biggest thanks of course to Lucy herself. Without her sharp eye and brilliant mind the show would not be half as good as it is today. Then there was Cheltenham Literature Festival where performed with Hollie McNish and Erin Fornoff I stayed in a fancy hotel and got to hang around to see lots of interesting talks and readings and eating yummy food. In November I wrote three poetic monologues from the perspective of three different women in the same fictional pub. These monologues saw me experimenting with complicated audience participation for the first time. Whilst in Edinburgh, I saw Duncan Macmillan’s Every Brilliant Thing and was inspired to have a crack at something similar with regards to involving the audience. I was lucky enough to perform my new monologues in the famous George Tavern, East London for the amazing production company Drunken Chorus. The experiment worked much better than expected and I’m looking forward to developing the idea further soon and hopefully working with Drunken Chorus more extensively in the future too. 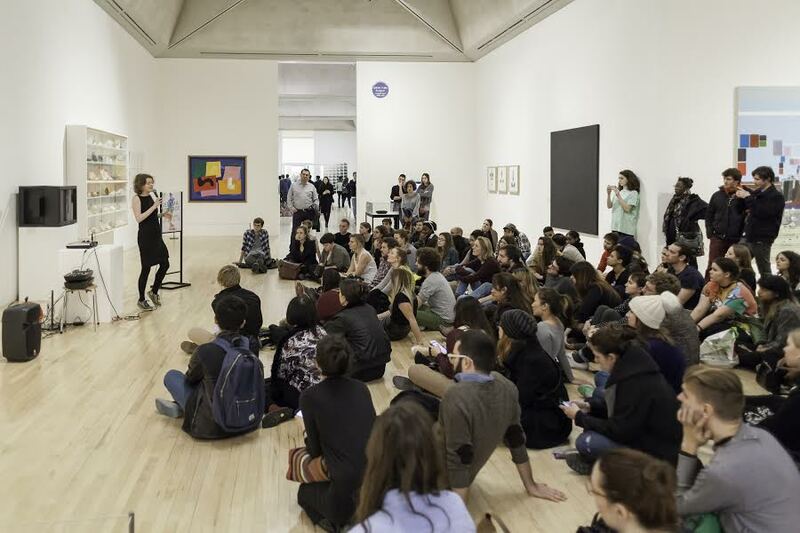 I said goodbye to 2015 with a performance at the Tate Britain at their Late at Tate: Celebrity event. The Tate Collective invited me to write and present new work inspired by the collection and by the theme ‘celebrity.’ I spent a full day walking around the Tate getting really inspired by the collection and then began to write. This commission marked a big step forward for me as I decided to branch out from my comfort zone and use a loop pedal. I recorded phrases of songs I’d written, looped them and then harmonised with myself to create a live backing track to speak over. It was very exciting! You should be seeing a lot more where that came from in 2016. I also delivered two workshops where the participants wrote and performed haiku about celebrity as well as performing a song I taught them and all this in just 45 minutes. Very brave! Very impressive! So that was that for 2015. An incredibly thrilling ride!! I’ve got a number of exciting projects and collaborations in the pipeline too, so watch this space! There were, of course, many more fun gigs and amazing experiences with lovely people but because I’ve not been keeping a blog I just can’t mention them all right now. This post is far too long already, if you’ve got down this far, well done! I’m going to try to post a bit more regularly now – at least monthly or something eh?